We have Yamaha Tyros 4 Pre-Owned available as a pre-owned unit. Call us for details on condition and spec. Click to view list. 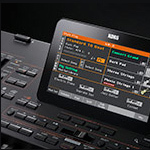 There is something for everyone on the new Tyros4 with many more Super-Articulation 2 voices. Super Articulation voices that can be used in the rhythm section. A new sound system the Yamaha MS04 satellite speaker with sub bass woofer system. A new board (free whilst the Yamaha campaign lasts) that allows samples to be played instantly rather than having to be loaded into DIMM memory. Although the appearance of Tyros4 is based on the previous successful Tyros range, the focus is on a cool blue color scheme with improved ease of use. A&C Hamilton`s Tyros4 is special. An excerpt from the Yamaha brochure describes our first impressions perfectly and the sound? Better than ever. More natural,more authentic, and exceptionally expressive. It`s a difference you can instantly hear - one that inspires you to new creative heights and lets you play your dream. The super articulation voices used in the Yamaha Tyros4 take you to a level of expressiveness that youve never heard of in a keyboard. The fantastic new choir voices sound remarkably human and change in tonality to suit the way that you play. Woodwind and Brass instruments feature natural legato and staccato expression and lets you use performance effects such as pitch bend vibrato and modulation. 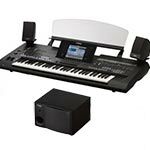 Yamaha Tyros4 has 993 voices including sweet cool and live voices, each with its own dedicated method of sampling and production bringing to your finger tips voices of instruments from all over the world. Mega voices are designed for programmers to use in the style section for extra realism within the rhythms. 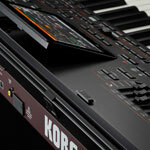 The 10th anniversary special edition Tyros4 has an FL1024 built in which means you can have new sounds easily. The FL1024 is a special type of memory that allows new samples to be stored on the Tyros4, these samples can then be used as any other voices. There is no painful load times as with previous sample memory. The Vintage keyboard library of sounds are being included with the annivesary model. The ever popular organ sound is well represented with the Tyros4. Digital drawbars allow you to create your own organ sounds, sliders below the main screen allow you to instantly change the make up of the sound. The change in tone when you use the sliders is instant and without sound glitches. Tremolo and chorus can be switched on and off with ease as can the fast/ slow leslie effect. 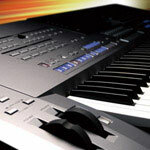 The new Yamaha Tyros4 has over 500 built-in dynamic styles. A significant development for the Tyros4 is the use of super articulation voices within the style section. this gives the huge team of dedicated rhythmn programmers much greater choice and flexibility in making the orchestrations interesting and toe tapping. Guitar parts and human voice parts benefit significantly from these changes. Undoubtedly Yamaha lead the field with quality styles in keyboards, from traditional bossanovas to bang up to date hip hop and rap, the Tyros4 carries on and improves upon current options. The human singing voice is used in music everywhere; on records, in church, football matches, even at work. the problem is that this makes it very difficult to imitate convincingly. Yamaha have introduced some new techniques in sampling and processing to create awesome new vocal sounds and significant improvements to the Vocal Harmony (VH2) facility. Ambient sampling is a new method for sampling classical vocal sounds. Normally you would place the microphone as close as possible to the source of the noise, with ambiemt sampling the microphones are positioned very carefully within the room to capture not only the voices but also the rooms ambience. Wave cycling is the voicing technology used by Yamaha to create fantastic pop vocals altering shoo-bee-doo-wop as a multi sampled layered sound that you have control over. When used in the rhythmn section and by the player a whole new sound is created full of human influence. The overall effect is awesome! There are 44 vocal harmony presets included on Tyros4, great starting points to see how you get along, everything is editable so if its not quite right for you you can change it. Tyros4 now includes a new synth vocorder. This real time vocal processor uses 1 of 10 carrier voices together with the microphone signal to create a talking synthesiser effect. It`s still worth mentioning that Tyros4 still has all the standard features you would expect from a top of the range keyboard. You can make and edit your own styles, take styles from the Tyros 4 and change them or take styles from the A&C Hamilton Turbo Stick and edit them to suit yourself. There is a 16 track sequencer for you to do your own instant recordings, dead easy to use but offers the flexibility for you to punch in punch out and change absolutely anything you want. 16 tracks of utter freedom. Not to be confused with the 16 track record feature, the real audio recorder allows you to make recordings of anything thing from the Tyros4 and save it in a useable format for ipods hi-fis car stereos. For example: you can plug the mic in play your favourite song, sing along and record it all and save it to a usb stick and then play it on your computer or hi-fi. Its extremely versatile and professional, allowing you all the best effects of a proper recording studio.